Martin Ignačák, who is accused of plotting attack on a train transporting military equipment, was in fact trapped by government agents who had infiltrated anarchist circles and indicated the target to Martin along with plans about how to carry out such an attack. The specific repressive tactic is a strategic doctrine in US counterterrorism policies, which are well known to be basic guidelines on the formation of repressive policies on a global level. Secret services take on the role of thought police, penetrate in subversive movements, single out comrades who support practices of direct action and suggest targets and plans for attacks, only to capture them later, without any action having taken place at all. In the US, there are many such examples of prosecution and imprisonment of fighters from the wider radical movement (from anarchists to activists of ALF and ELF). Operation Fénix unleashed by the Czech State is its first organized attempt to apply the specific repressive doctrine in order to paralyze a combative anarchist current that has been developed in the Czech Republic in recent years. Martin has already spent nearly 14 months in prison awaiting trial; nevertheless, the vindictiveness of the state apparatus against the comrade continues, with constant harassment of his relatives, his motions for replacement of pretrial detention with bail conditions denied, and debilitating conditions of imprisonment. From our side we stand next to Martin, overcoming the artificial polarity between innocence and guilt, and demand that his requests be met. International solidarity is an integral part of our processes, as it breaks down the borders that separate us and sends out messages of rebellion and defiance from every location where these are manifested, in every corner of the world, thus diffusing the cracks opened in the authoritarian edifice. 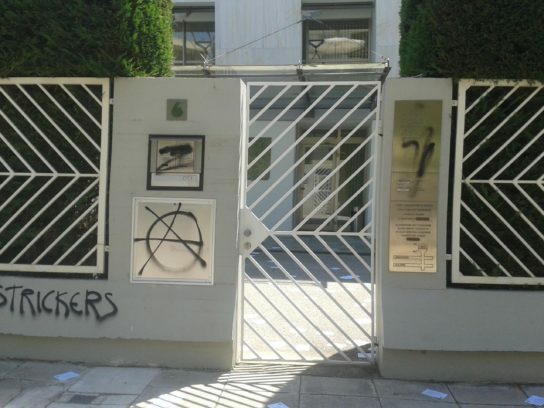 On Friday June 24th 2016, Anarchist Black Cross carried out a solidarity action outside the embassy of the Czech Republic in Palaio Psychiko [one of the wealthiest northern suburbs of Athens]. 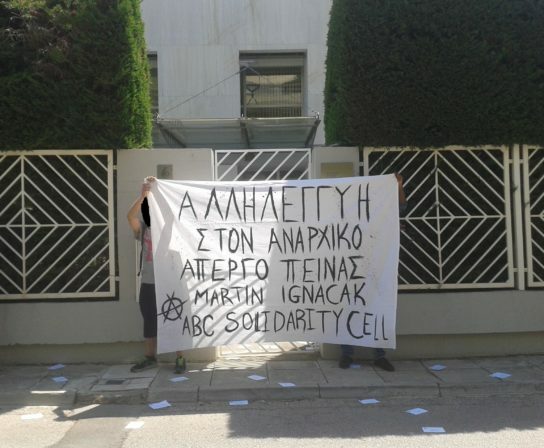 We hung a banner, spray-painted slogans at the embassy’s entrance, and threw flyers to make evident that we know who will be accountable if our comrade’s health condition deteriorates. The same day, on Lesvos Island, a banner was hung in the city of Mytilini as a minimum display of solidarity with comrade Martin Ignačák. PS. In Athens, after leaving the Czech embassy in Palaio Psychiko, cops of DIAS motorcycle police force followed a bus which individuals from the action were aboard. 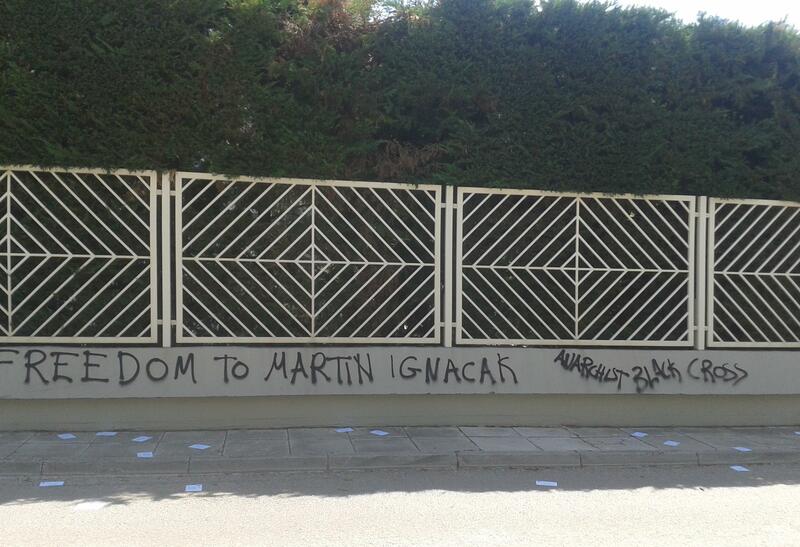 They stopped and stormed the bus on Kifissias Avenue, forced people out, and took them to GADA police headquarters. After two hours, all were released but one, who was released several hours later. Solidarity isn’t going to become an inward-looking process; our actions won’t be constrained by repression. Repression doesn’t hold us back. 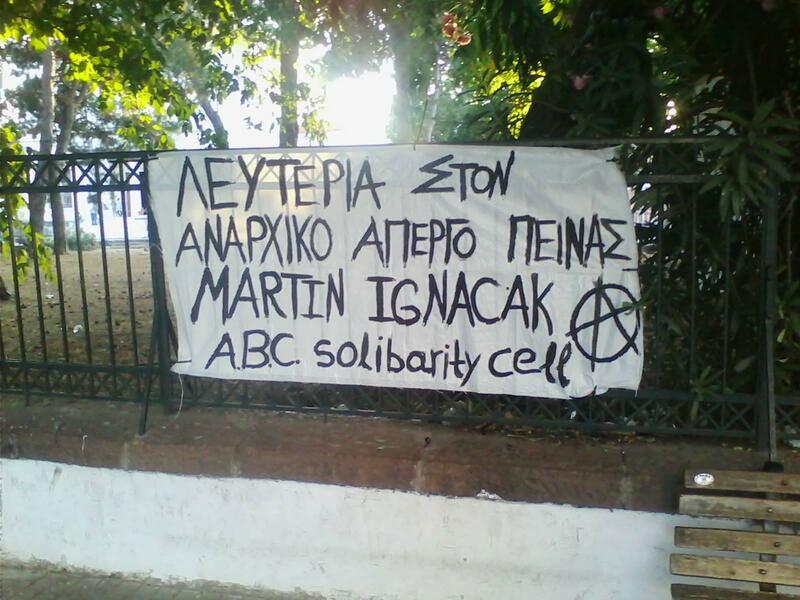 This entry was posted in Actions/Events, English, General, Graffity, International, Martin I. and tagged Athens, embassy, Greece, hunger strike, Lesvos, martin i by ANTIFÉNIX. Bookmark the permalink.